" Josh Brolin's uncanny performance as a young K gives the film a fresh twist and allows it to flourish. Interpreting, rather than mimicking, the young K, Brolin opens a window into what life with K would have been like before he became the unemotional scrooge that we all know and love. " Tagline: They are back... in time. Agent J (Will Smith) travels in time to Men in Black's early years in the 1960s, to stop Boris the Animal (Jemaine Clement) from assassinating his friend Agent K (Josh Brolin) and changing history. Brolin ensues. Considering MIB3 comes 15 years after the original, I understand that argument. What’s the point, right? Well, I’m not here to point/counterpoint the necessity of the film; I’m here to explore whether or not it succeeds in entertaining you. MIB3 takes the concept of the original film (there is a secret organization that exists for the sole purpose of policing extraterrestrial affairs on earth), adds a little time travel, asks Brolin to knock his role out of the park, and proceeds to neuralize the audience into forgetting the unnecessary let’s-make-some-quick-cash sequel. If it succeeded at nothing else then that would have been enough for me. As much as we all love the chemistry between the hot-doggin’ shenanigans of Will Smith’s Agent J and the I-use-corn-cobs-for-toilet-paper curmudgeonly ways of Tommy Lee Jones’ Agent K, it’s Josh Brolin’s uncanny performance as a young K that gives the film a fresh twist and allows it to flourish. No stranger to chameleon-esque performances, Brolin so immerses himself into the character that you would be forgiven for the assumption that you’re watching the magic of CGI. Interpreting, rather than mimicking, the young K, Brolin nails the voice, mannerisms, and vocal inflections, opening a window into what life with K would have been like before he became the unemotional scrooge that we all know and love. OK, I’m a Brolin fan and you’re accustomed to paragraphs such as the above. Give me 10 minutes and I can convince you that Josh turned The Mod Squad into cinematic gold. So, what are my complaints? I would’ve liked a few more creative alien designs. The climactic twist is fairly predictable and purely designed to manipulate emotion. Boris the Animal, zealously portrayed by Jemaine Clement, deserved more backstory. There’s quite a bit more profanity than in the previous movies, making this much less kid-friendly. Thankfully, the flaws are adequately masked by some cool special effects and great performances. As long as you’re not expecting a mind-blowing, revolutionary experience then you shouldn’t have a problem checking out of reality and being entertained for a couple of hours. If little else about the film interests you, Brolin’s performance is worth the ticket price alone. And I say that with as little bias as possible. Tommy Lee Jones is in No Country for Old Men with Josh Brolin who is in Hollow Man with Kevin Bacon. 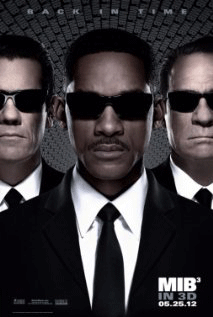 Rated PG-13 for sci-fi action violence, profanity, and brief suggestive content, Men in Black 3 contains a handful of "s" bombs and several other "primetime television" profanities (a**, d**n, h**l). The Lord's name is also taken in vain a few times. Though this all aligns with the PG-13 rating, the elimination of the language would have warranted a PG rating, and it would have been very easy to recommend for the entire family. Blog format is a good idea. Don’t do the twitter thing – sorry. I haven’t seen MIB3 yet. I want to ‘cos of Josh so I’ll probably get around to it. The first one was OK (and I loved D’Onofrio in that one) so I can probably manage this.